The Woman’s Exchange is awarding a total of $250,000 to 18 arts and cultural organizations and 24 students pursuing a higher education in the arts, the nonprofit announced on May 15. The monies dedicated to those purposes were earned entirely through the organization’s 10,000-square-foot consignment operation, located at 539 S. Orange Ave. in downtown Sarasota, a news release points out. 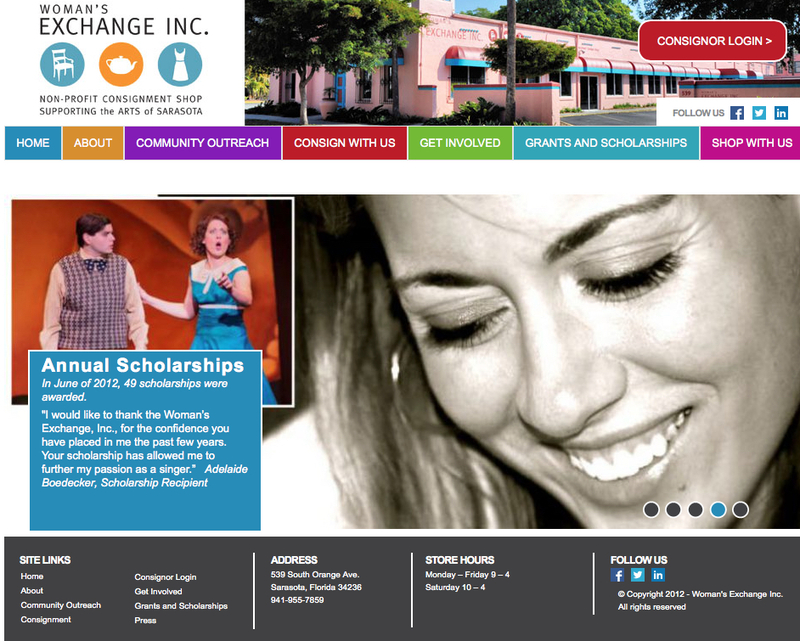 The members of the Woman’s Exchange board base their decisions about the recipients on the long-term stability and financial health of the organizations, “[a] program’s overall appeal to the general public and the educational impact some of these same programs will have on area children,” the release adds. Scholarships are awarded based on grade point average and the individual’s artistic goals and achievements, as well as letters of recommendation, the release notes. The Woman’s Exchange has been supporting the local arts community for 55 years, awarding more than $8 million in funding, the release points out. In addition to the grants and scholarships it presents each year, the Exchange has paid more that $16 million over the past nine years to local residents “who consign their gently used merchandise through the organization’s consignment store … further benefiting the local economy,” the release says. “One of the area’s largest recyclers,” the release notes, the Woman’s Exchange is a debt-free nonprofit organization. Asolo Theatre Inc.: Season Presenter. Florida Studio Theatre: Winter Cabaret Series. FSU/Asolo Conservatory for Actor Training: Dog Days Theatre. Gloria Musicae: Mass in B Minor, Key Chorale: Honoring Heroes. La Musica di Aslo: La Musica Educational Outreach. Perlman Music Program: Everyone Loves Classical Music. Sarasota Ballet: The Secret Garden. Sarasota Opera: Youth Opera — Rootabaga Country. Sarasota Orchestra: Young Persons’ Concerts 2017-18. Sarasota Pops: Concert Series 2017-18. Urbanite Theatre: Naming True by Natalie Symons. Van Wezel Foundation Inc.: Additional Instrumentalists — 3 Concerts. The Venice Chorale: Additional Instrumentalists —3 Concerts. Westcoast Black Theatre Troupe: 2017-18 Mainstage Season. The Woman’s Exchange scholarship recipients for the 2017-2018 fiscal year are Victoria Byrd, Anthony DeNiro, Marie Dull, Zoe Ezechiels, Joshua Galindo, Melanie Gasparoni, Abigail Hodgson, David Klos, Tyler Mathis, Douglas Ortner, Rachael Querreveld, Haley Simmons, Anna Jane Trinci, Reed Tucker, Margaux Albiez, Sommer Altier, Marissa Brotz, Anthony Cali, Evianna Gianoplus, Coralie Jean-Marie, Madison Miller, Haley Rosenthal, Nina Vanucci and Hannah Jae Wasserman. For more information about the Woman’s Exchange, visit www.sarasotawex.com.